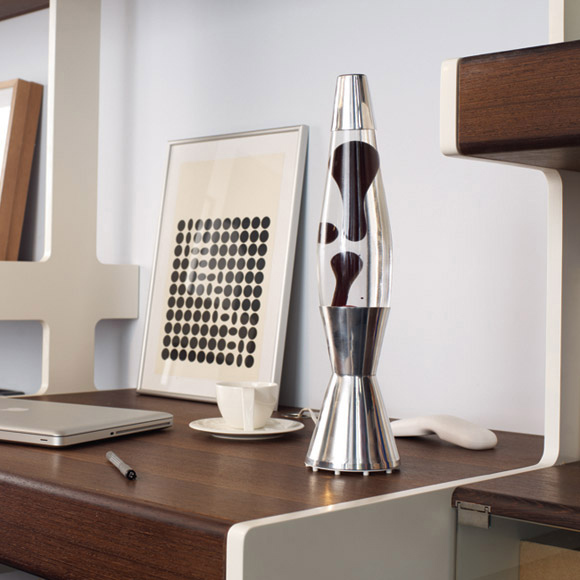 Designed by the inventor of lava lamps Edward Craven Walker and hand made in Britain for over 50 years. 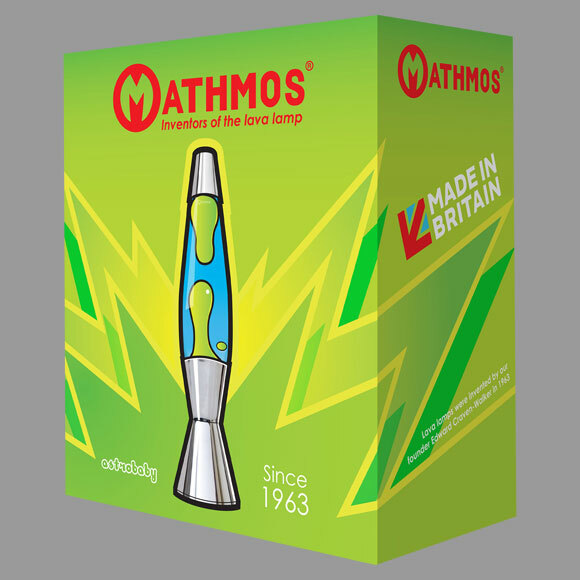 Manufactured in Britain since it was designed by the inventor of lava lamps and founder of Mathmos, Edward Craven-Walker, the year after the astro in 1964. This thinner, sleeker alternative to the astro has been in continuous British production throughout its long life. It has highly polished metal parts in silver and a choice of 8 lava colour combinations all in Mathmos' unique long lasting lava lamp formula. 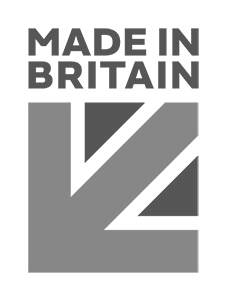 Replacement parts, including bespoke bulbs, are available from Mathmos on an ongoing basis. 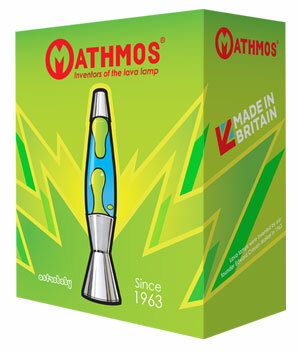 Mathmos makes the astro baby lava lamp in Britain; our lamps are made to the very highest quality and safety standards. See video. Replacement parts including bottles and bulbs are available for the astro baby for lamps made in the 1960s right through to the present day. 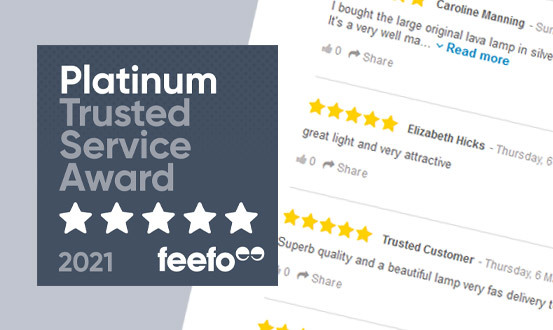 Mathmos is a Gold Star Trusted Merchant online; visit Feefo to see reviews of our products and service. Mathmos unique lava lamp formula has brighter, clearer liquids, lasts longer than other lava lamps. 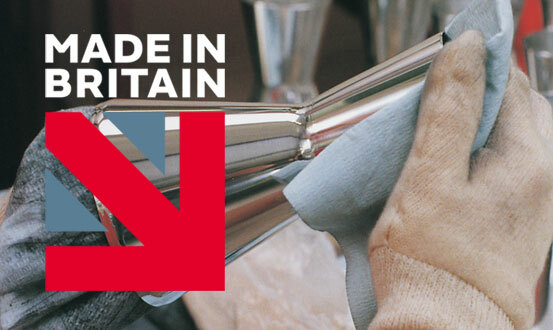 We use only the highest grade aluminium and polish it to a high shine. Long lasting halogen bulbs made specifically for use with Mathmos lava lamps direct light and heat into the lava and away from the base. Well designed gift packaging ensures your lamp arrives in perfect condition and is appreciated from the moment it is seen. 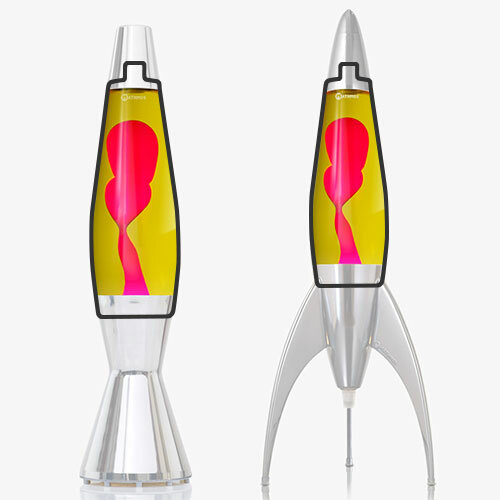 Astro baby is the second lava lamp designed in 1964 by the inventor of lava lamps and the founder of Mathmos Edward Craven Walker. It has been made in Poole, Dorset, England for over 50 years and exported around the world. 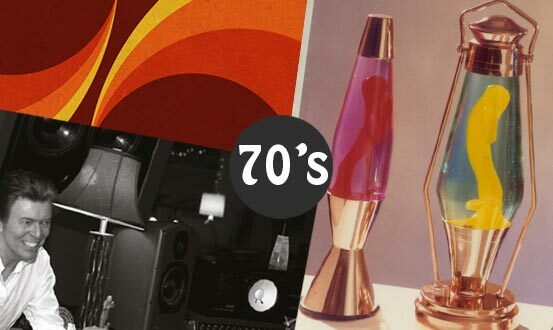 Millions of astro baby lava lamps appeared in up to the moment homes of the time. Seen here in Bowie's studio. Updated in the 1990s astro baby is seen here shot by Rankin for Dazed and Confused magazine. Is a pop design classic that looks as fresh and fun as it did 50 years ago. 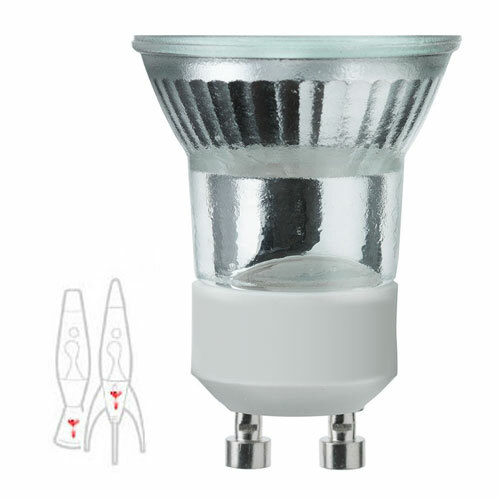 Light: 240V Max 30W E14 Spot bulb or 240V Max 28W mini GU10 Halogen Spot bulb. Please check your lamp base before ordering a replacement. This bulb is primarily used as a heat source. For Mathmos lava lamps only. Not for household room illumination. Lava lamps are not toys. Please position them well out of reach of children under 14 years old. Choose a position for your lamp on a level surface in a room with a temperature between 20 and 24°C or (69 to 75°F). do not place on carpets or block the ventilation spaces beneath the lamp. Put the bottle on the base with the screw cap at the top. If it is not sitting straight please rotate a little. Then plug it in and turn it on. NB. It is normal for the glass to have small air bubbles and moulding scars. Warm up takes between 1 and 3 hours depending on the size of the model and the surrounding temperature. Stalagmite shapes may form during the warm up process, these will then melt and the lava will begin to flow. Your Mathmos lava lamp will operate best after it has been used four or five times. For the first few times you may see small air bubbles in the lava. Please do not leave your lava lamp on for more than six hours a day; this will prolong the life of your lamp. Overheating will shorten the light of the life of the lamp. Overheating is occurring if there is either one large bubble or many smaller ones. Never move or shake the lamp when it is in use or still warm as this causes irreparable clouding. It is normal for the base to become very hot. When your lava lamp has ended its life it will begin to go cloudy, the colours may fade and it will not move as well as it once did. This will happen after approximately 2000 hours of operation. You can then buy a new bottle at www.mathmos.com in the current colours available. Please note we do not refill bottles and please on no account open the bottle or add liquids. If the bulb blows please replace it with one of the same type and wattage. Only fit the correct bulb, as stated on the label in the base. Again bulbs can be bought at www.mathmos.com as can many replacement parts. This lamp has passed the relevant safety standards and carries the statutory guarantee of the country of purchase. The liquid in the lamps are not dangerous and can be disposed of normally. Never use a lamp if the bottle has been dropped as this will create weakness in the glass, obtain a replacement bottle and dispose of the old one. Do not leave the lamp unattended with small children. If the liquid is swallowed by mistake drink plenty of water. If it is spilt onto the skin or had contact with the eyes pour on cold water. If any symptoms appear please visit a doctor. Q. Can I buy replacement parts for my lava lamp? A. Yes Mathmos lava lamps are designed to last please buy replacement parts here. Q. My lava lamp is faulty what can I do? A. Firstly read through these FAQs to see if your question has been answered. If not we offer a one year warranty on all our products. If your lamp was purchased less than a year ago, please contact our customer service team who will be happy to assist. Please read our Faulty Product Returns Advice. Q. Why is my lava lamp cloudy? A. Lava lamps become cloudy for two reasons; either they have been shaken or moved whilst hot or they have reached the end of their life (2000 hours). You can purchase a replacement bottle for your lava lamp here. Q. Why does my lava lamp have specs and bubbles in the glass? A. Mathmos lava lamp bottles are manufactured in one of the highest quality automated bottling factories in Britian. Even so small bubbles are a normal part of this manufacturing process, it is not a fault. Q. What are the differences in quality between a Mathmos lava lamp and others? A. A different lava formulation giving better lava flow, longer life, clearer liquids and more vivid colours. The metal parts are of a thicker, higher grade metal allowing us to hand polish them to a high shine. Our bulbs are directional taking the heat away from the base and directing the light into the lava. 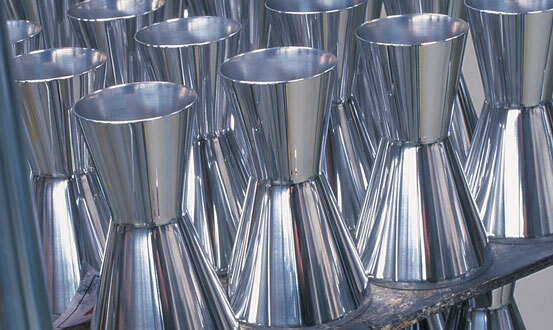 We have a higher standard of safety and build quality audited by a number of different bodies. 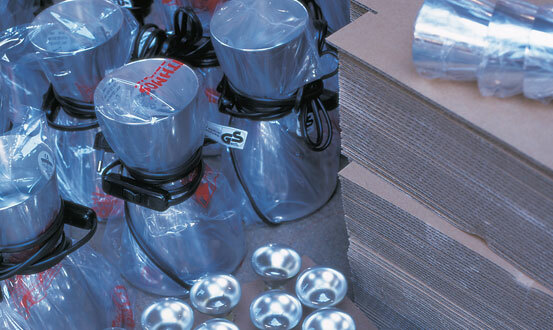 We provide a comprehensive range of spare parts unlike other throw away products. 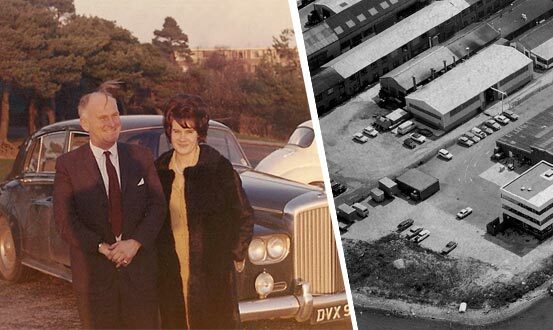 We have 50 years of British manufacturing excellence to draw on. Q. How long should it take for my lava lamp to warm up? A. Lava lamps should start working within an hour to an hour and a half of turning them on. First they will form stalagmite shapes, then they will start to form lava lamp shapes. Please note, new bottles will take longer to heat up (up to three hours), but the heating time will decrease after several uses. If your lava lamp does not warm up in this time it may be positioned in the wrong place or the room may be too cold. Lava lamps should be positioned away from drafts and air conditioning. The room should be at least 20 degrees centigrade. Q. My lava lamp just has one large bubble sitting at the top of the bottle that does not move? A. The lava lamp is overheated. It could have been on too long (more than 8 hours), so please turn it off and allow it too cool. Or it is positioned in a room that is too hot (more than 24 degrees) or next to a heater. Please reposition your lamp. Q. How should I dispose of my lava lamp bottle when it reaches the end of its life? A. Please make a hole in the metal cap with a sharp point, then pour away the liquid. The bottle may then be recycled through your local recycling centre. Q. Can I buy new liquids for my lava lamp? A. Lava lamp bottles are a sealed unit and so we do not sell the liquids separately, but you can buy a new bottle and contents for Mathmos lava lamps here. Q. Can I buy a new cap for my lava lamp bottle? A. Lava lamp bottles are a sealed unit and so we do not sell the cap separately, but you can buy a new bottle and contents here. Q. Why is my Astro bottle not sitting straight in the base? A. Bottles are now supplied with a lip which runs around the lower part of the bottle, to ensure it will sit straight in the base. When the bottle is placed on the base, it should sit securely, although it will still be possible to move the bottle from side to side. If your bottle isn't sitting correctly, please please contact our customer service team . Q. How long do lava lamp bottles last? 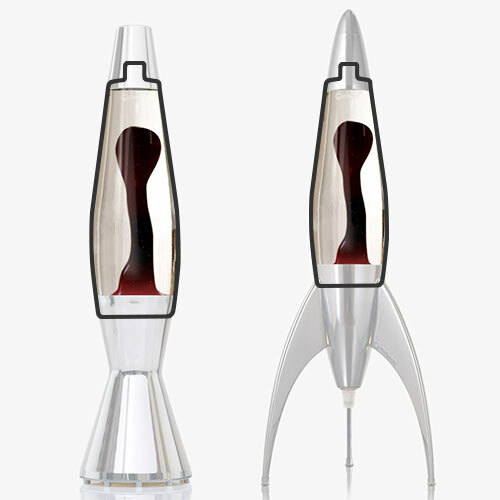 A. Mathmos Lava lamp bottles last for approximately 2000 hours of use. After this you can buy a replacement bottle here. Q. Where can I buy replacement bulbs for my Mathmos lava lamp? A. Mathmos have large stocks of replacement bulbs for our lava lamps available here. Q. What is Mathmos doing about halogen bulb phase out? A. Don’t worry whilst some halogen bulbs are being phased out for lighting purposes Mathmos uses halogen bulbs primarily to heat its lava lamps rather than to light them; so the use of halogen bulbs in our lava lamps is part of a special purpose exemption under current regulations. We have large stocks of these special purpose bulbs and we also have an ongoing supply. We also have alternative ways of powering our iconic lamps should there be further changes to the regulations in the future. Q. Why don't you do replacement bottles in the colour I want? A. Mathmos have made a huge number of colourways over our long history, it is not possible to keep all the colours in stock. Please choose from the current range. Q. Do you offer custom refills? A. We are sorry, but we are not longer able to offer this service. The only colours available are the ones listed here. Q. Why has my lava lamp made strange stalagmite shapes? A. This is a normal part of the warming up process. Please leave it on longer and then it will start to form moving lava shapes. Q. My lava lamp is not lighting up? A. Please check that your bulb is working. You may buy a new bulb here. Alternatively, please check the integrity of the fuse in the plug. Q. Can I buy Mathmos lava lamps for delivery to the USA and Canada? A. Not at the moment. Q. Why can I see bubbles in the lava? A. Small bubbles in the lava are normal particularly when you first receive the lamp. As you use this over time the bubbles will reduce. Q. Why has the liquid in my bottle gone clear? A. Over time the dye in the lava liquid will fade, particularly if it is positioned in direct sunlight. If you lamp was bought within the last year and the instructions were followed please contact our customer service team. If your lamp was bought over a year ago you can buy a new bottle here. Q. The liquid level of my lamp is too low. Can I top it up? A. No Mathmos lava lamp bottles are sealed units. Do not attempt to take off the cap and on no account top up the liquid. The heat from a lava lamp causes the liquid to expand and topping it up could cause the lamp to be overfilled and put pressure on the glass as the liquids expand. If you are not happy with your bottle buy a new one here. Q. Why is there wax sticking to the side of the bottle? A. If you use the lamp a few times this wax should join the rest of the lava. If this does not happen and your lamp was bought less than a year ago please contact us here. If you lamp is over a year old please buy a replacement bottle here. Q. Do you offer any colours in addition to what is shown on your website? A. No however we do constantly add new colours so sign up to our mailing list to be notified of new colours as they are released. Q. My Jet lava lamp isn't working, what can I do? A. You may be able to buy bulbs for your jet here. Otherwise I'm afraid we can't help; the jet was discontinued many years ago. Q. Why can I see a metal spring coil floating in my lava lamp bottle? A. The metal spring is an essential component of a lava lamp bottle. However it should be sitting at the bottom of the bottle. Run the lamp for several hours and hopefully the spring will settle in its right place. Q. Why won't my new Telstar bottle fit on my old Telstar base? A. Bottles and base tolerances do vary a little over time, please contact customer services here. Q. 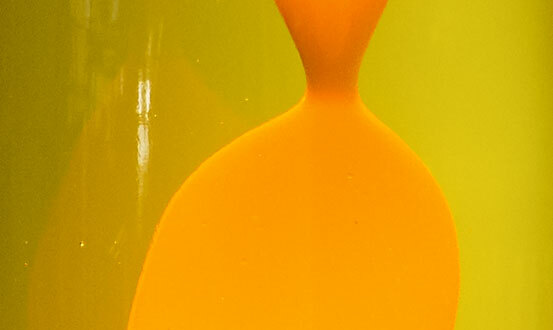 Why can I see a foreign object in my new lava lamp bottle? A. There should not be anything other than lava and liquid in the bottle, please contact customer services here. Q. How old is my Lava Lamp? A. There have been many small changes in the manufacture of Mathmos lava lamps over our long period of production. Dating lava lamps is not something we can do for you. You might want to visit one of the specialist sites such as www.flowoflava.com to begin this process. Q. How can I clean my lava lamp? A. The bottle should be cleaned with glass cleaner and a cloth. The base and cap is aluminium so please use recomended products. If in doubt just use a soft cloth. Q. My lava lamp broke on the floor. How do I clean it? A. Dispose of as much liquid and lava as you can remove from the floor. Then use recommended cleaning methods for removing coloured water and wax for whatever floor you have. Q. Can I buy Bayonet fitting bulbs for my 1960s lamp? A. Not from us I'm afraid we suggest you look online. Q. Can you fix my Smart Astro? A. Please contact us here to discuss this. Q. Will a replacement bottle fit my 1960s Copper Astro or Lantern? A. Yes it should do. Q. The replacement bottle I ordered doesn't fit my lamp. Can I change it? A. Yes please contact customer services here. Q. Can I buy new liquid and wax? A. No please buy a complete new bottle here. Q. Can I buy a glitter bottle? A. Glitter bottles are not currently available. Q. What is the lifespan of a bottle or bulb? A. Mathmos lava lamp bottles last 2000 hours. The life of the bulbs vary depending on usage but replacement bulbs are available to buy from here here. Q. Can I buy replacement bulbs for my USA Telstar lamp? A. Not from us I am afraid we suggest you look online in the US. Q. Can I buy replacement bottles/bulbs for my 3-in-1 lava lamp? A. Whilst we do not have stock of the bottles or bulbs for this discontinued product you can buy regular bulbs and bottles here. Q. I've lost the rubber protectors from the bottom of my Telstar. What can I do? A. Please contact customer services here. Q. Can I buy a new glass heat shield for my fluidium? A. We do not supply this part currently. The heat shield is no longer required if the lamp is used with the current Fluidium bulb. New bulbs for the Fluidium can be bought here. Q. Can I get a new dimmer for my Lunar? A. We do not currently supply this part for the discontinued Lunar. Q. Are Mathmos lava lamps suitable for children? A. 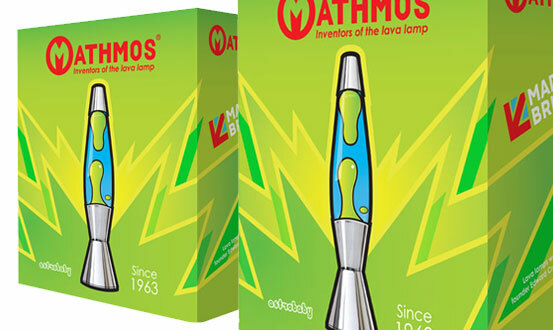 The only lava lamp suitable for children is the Mathmos Neo. The Neo was designed with children in mind, so as well as looking stylish it is also shatterproof, has fixture points, doesn’t get too hot, and is screwed together as a secure unit. This means the lamp has passed the stringent safety checks needed to be classified as child safe, something no other lava lamp in the UK is classified as. We recommend other lava lamps be placed well out of reach of children under 14. Q. 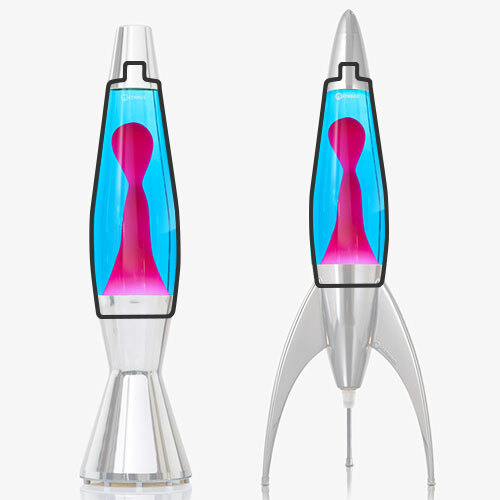 Can I use the Neo bottles in my Telstar or Astro Baby lava lamps? A. No Neo formulation is different the bottles will overheat in other models and Astro Baby and Telstar bottles will run slowly or not at all in Neo. Q. I am having trouble fitting my Neo together. A. Remember to put the cap and back element on top of the bottle before you put it on the base. Please see the Instructions tab. Q. I have lost the screw holding my Neo together. A. You can use an Allen key of the appropriate size or failing that buy another screw, or any other spare parts for Neo. 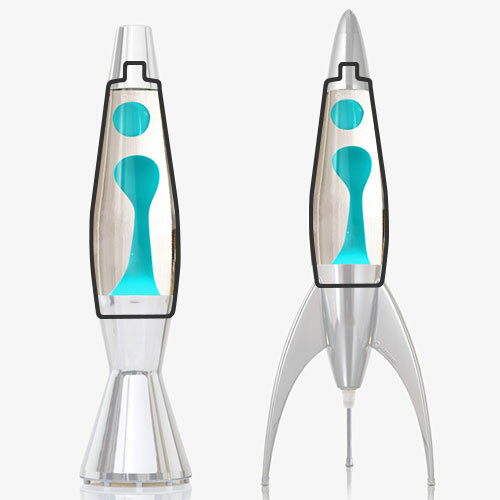 Q. Neo’s bottle looks a little different to the other Mathmos lava lamp bottles why? A. It has a shatterproof coating, this helps hold the glass together should the bottle be dropped and break. Buy more bottles here. Q. Why does my Neo not come on immediately? A. A slight delay before the light comes on is normal with halogen bulbs. Q. 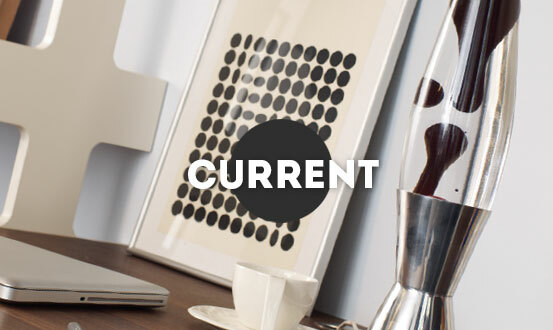 What makes Neo qualify for a certificate for all ages unlike other lava lamps? A. Several stringent criteria must be met to achieve this, for example; the bulb should not be accessible without a tool, it must be low voltage not mains voltage, it must be very stable, it must have a shatterproof coating on the glass, the bottle must be attached to the base and it must not be too hot. Q. Can I easily change Neo’s bottle and bulb when they end their lives? A. Yes undo the screw at the back with the Allan key provided then Neo comes apart and you can access both the halogen capsule bulb and the bottle. Remember to wait until the product is cold to do this. Buy spare parts here. Q. There is a little light bleed from the joints at the back of Neo, is this normal? Q. The screw fixing Neo together sticks out just a little, is this normal? A. They do vary a little so yes this can be normal. Q. Can I buy a replacement bottle for my Jet? A. We are afraid that Mathmos no longer stocks replacement bottles for the discontinued Jet model. Q. Can I buy a replacement bottle for my Lunar? A. Yes these are available here. Q. Where is the Mathmos brand on my lava lamp? A. 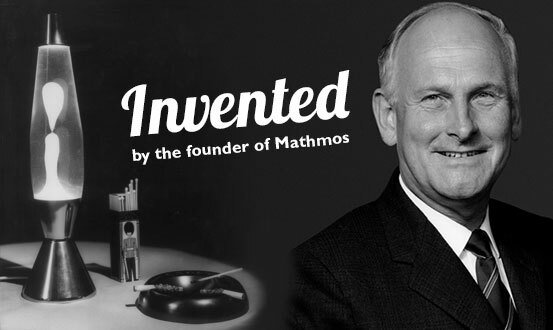 The Mathmos brand is on the plastic base and either printed on the product itself, on a brand label on the lead or etched on the glass. Q. Why is there is a small gap between the base and the bottle on my astro ? A. Some astros have a shadow gap between the base and the bottle; this is normal. If for any reason you do not like this please contact our customer service team. Q. What is the best size of tea light for Fireflow? A. The taller tea lights 15mm high work best. Q. Will Fireflow work outside? A. Yes like any unprotected candle light you need a place with no wind.